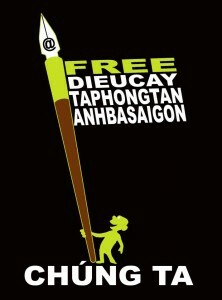 Vietnamese bloggers Dieu Cay, AnhBaSG, and Ta Phong Tan were found guilty by a Ho Chi Minh City court of violating article 88 of Vietnam’s criminal code, which involves the “spreading fabricated news in order to foment confusion among people” and “defaming the people’s administration.” Aside from serving a prison term, the three will also face house arrest. What disgrace has been brought to the good Vietnamese people by the abuse of power and the cowardly fear of free speech! Politicians should be able to answer with reason if they think someone has distorted what they say; they should be able to cope with opposition. Hang your heads in shame and allow the good citizens of Vietnam to speak the truth in freedom! Free Maria Ta Phong Tan! Blog Dan Lam Bao has been reporting anything that the government aka Vietnamese Communist Party (VCP) forbids, i.e. corruption and dissidence. 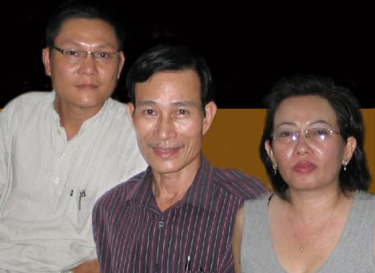 Blog Quan Lam Bao started( in July 2012) although reportedly champions for the anti-corruption cause, only reports corruption cases that are related to Nguyen Tan Dung, his son Nguyen Thanh Nghi, his daughter Nguyen Thanh Phuong and her husband (Harvard-trained) Nguyen Bao Hoang. Blog Bien Dong only discusses about South China Sea disputes, between China and Vietnam, the Philippines. Pictures and videos showing Vietnamese or Filipino demonstrators against China are strictly forbidden by the VCP. Facebook and other social networking sites are blocked here, but the state firewall is so flimsy that even schoolchildren know how to fiddle with computer settings to get around it. The government has announced bans on websites, only to see traffic to them skyrocket. Three bloggers were sentenced to prison this week — one for 12 years — but many others continue to pursue their causes.